SIGforum.com Main Page Mason's Rifle Room Has anyone tried the Franklin Armory Binary Triggers? I've watched a few you-tubes, of installs and shooters; they're up to Gen III now with being able to switch to safe at any point in the firing process. It seems better than bump-firing or those slidefire stocks ... while they aren't cheap ($399) its no where near full-auto prices, and you don't have to get big brother's okie-dokie to take them anywhere out of state. For those that want to throw in their comments about safety and or burning ammo ... you aren't contributing to the thread but go ahead if you can't control yourself. This new design, the safety rotates to the 3rd position ... the same as my M16 does for full auto. Even if you have the selector in Binary, have pulled the trigger for the first round, you can switch to safe and release the trigger and it won't fire ... it actually goes into safe mode same as any semi-auto. You can also switch to safe with the hammer in the fired (upright) position, which you can't do with the typical AR. Lastly, the trigger is supposed to have a 4.5 pound pull. I helped a friend install one in a AR9 build. Easy enough to install, ran without a hiccup. Having fired a few select fire guns, I found the binary trigger surprisingly easy to string shots together and very enjoyable. It’s on my list to buy someday. The plus on the FA G3 is it can be used in any type of AR caliber. The downside is even with all their updates to the trigger... you can out run it and get a dead trigger. Also you have to build up a rhythm to combat out running it. The trigger does have a light and crisp pull to it. Personally I prefer the Fostech Echo over the Franklin, especially the fact that you can't out run it. Downside is you can't run .22's and PCC you have to mod the bolt (can be done, but takes work). The day I leave the evils of the left coast, I will get one. Illegal in WA. I have a Franklin in my MPX and a fostech in my sbr DD Mk18. The Franklin has a little gritty feeling to it. The fostech is much smoother. And I have yet to out run either. If I were to by another for an AR platform I would go with fostech due to how smooth it is. Haven't tried the Franklin. I have two Fostechs though. I really like the double tap action. Of course with a little practice to train the hands and eyes, mag dumps at full auto rates are most fun and the rounds stay on target. I don't do that too much anymore because it burns through ammo FAST. I can dump a 20 rnd mag before the first casing hits the ground. Fun, but expensive. Mostly I just double tap when in the 'echo' mode. Pretty simple to install. Nice unit. Probably worth the money if you consider the cost of a select fire gun. Same rate of fire but in semi auto. ETA: After installing my first one I thought it was defective because it would randomly not binary fire. I called Fostech and they told me to ship it back at their cost to determine the error. Turns out the error was mine so I never sent it back. You've got to pull the trigger completely back for the second shot to occur. I was floating the trigger so it would not reset. I've tried both on a friend's rifles and I like the Fostech II. I've been waiting for it to come down in price. I just want one to have one. I have a select fire rifle from work issued to me so I can get my fix if needed. No personal experience but when I was researching these the Fostech seemed to be the bedt current option, as others have mentioned you cannot override it. I really wanted to find a Canadian LMG upper and put a Fostech in it....wish I had had the forethought to grab one when they were all over in SG for cheap. Check out the Bumpsaw thread on ar15.com if you want to do your best to simulate full auto with a combination of the binary triggers and the bumpfire stocks. It is definitely worth a look as the guys give detailed breakdowns of the components that they use. It isn't for me but it does look like fun. One guy was regularly making good hits on steel out to 400ish with his bumpsaw setup on an M60 handguard and bipod. And I have yet to out run either. You'll never be able to on the Echo, design of it won't allow it. But the Franklin is quite easy, I've out run it on 22. LR, 5.56, and .308. Pick up your pace a little more and you'll run into that issue. I'll check it out, you wouldn't happen to have a would you? I did a bit of research on the FosTech, it appears that without some mods limited standard bolt carriers which I'm looking for more versatility than that. The LGS had the Franklin in special this weekend for 10% off which made it $359.99 ... I bought it yesterday and spent the day today shaking it out. Unlike my M16 it's not a machinegun and there is definately a learning curve, but I got it running pretty well with a decent selection of springs & buffers ... I should have made notes and color coded my springs ... But most everything ran on a carbine length flat spring and standard buffer ... The CMMG PDW round best mini-mags, the beltfed likes a heavy buffer but I couldn't find anything that would run subsonic 300 Black Out ... and I did "out run" the trigger but it will run and in just about all cases the M16 isn't as picky. I used to think these were ammo wasting gimmicks... then I tried one. It was so much fun that I must have one. The one I tried was a Fostech. It ran as fast as I could make it go, and felt like full auto fire. It was so easy to double tap. Also, the rifle was a 300blk. After years of thinking that caliber was pointless, now I must have one of those too. I've shot a binary in a suppressed .22lr AR. It was great fun, and way more controllable than bump stocks or the like (especially in .22). I always thought it was kinda a gimmick, and still think it sorta is, but it sure is a fun gimmick! I take it that's a yes? I’m hoping they will come up with a design for the CZ Scorpion. SBRd that would be a killer platform. That is a most definite yes. I would get one of them for a AR. If I SBR my ACR I will put one in that as well. Oh do not forget a clone or a real semi MP5. It is not banned from travel like a NFA item. Now the gimmick part put aside, we did some IDPA/USPSA style setups and then modified the safety a bit by smoothing it out with some emery cloth. Double taps were nothing but quick obviously and when we went to hit the long range single shots it was easy to swap back and forth. 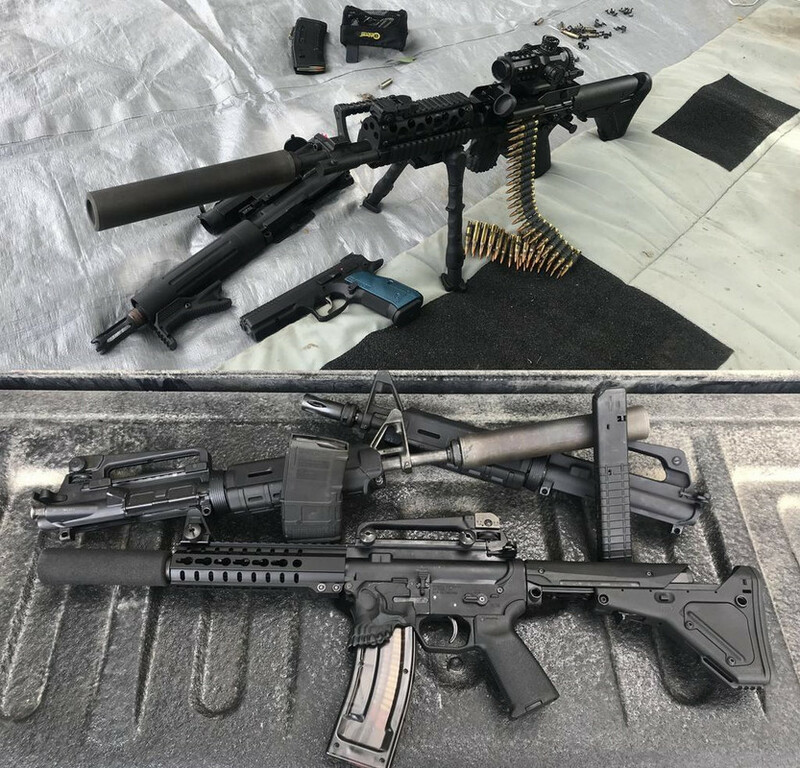 I first tried installing the trigger on a 8" AR in 300 blackout, and that did not go so well. So I switched it out to my 10.3" AR in 5.56 and I could out run that trigger every time. Proving it was a worthless adventure and $400 that I just pissed away. After being a little aggravated for a bit I did a bit of research. Then after a conversation with Para and some other great forum members about dwell time I built another rifle well two sorta. First I started with my tried and trued rifle which you see in the video a Bushmaster XM15E2S 14.5" with carbine length gas system. I did the math awhile ago (when I took that video) and it ran 625rpm with no failures and that is with me screwing up the rhythm at the start. It is the triggers new home, and it runs 100% every time. Out of frustration I bought an echo2 also ... I must have a better trigger than you because holding the trigger back isn’t a problem ... I missed the part about putting the two halves together and the first dozen or so times I put the halves together and pulled the charger handle back until they snapped together. My whole point was to run a short barrel and suppress ... hoping to have a oal of 16” or less, I guess I need to work on the tuning aspect more. On the plus side I’m getting better with the FA BFSII with my 11.5 556 upper, not sure if it was the spring/buffer combo or my trigger control. I probably do need to take notes as to what works. The curve on the EchoII is shorter but limiting factors are the bolt carrier ... it won’t run on my Colt 9mm or CMMG 22 PDW but it will on my AR57 ... I still need to try it on the MCR belt-fed. When I get frustrated I really question my reasons for buying both, but I am impulsive ... I like not having to ask uncle sugar if I can cross state lines with it like I do with my M16 & HK registered sear. And even with my frustrations I want one for my Scorpion EVO, HK MP5’s, 52 & 53 ... especially if I could run them like the guys in the videos! Now I’ve got to figure out how to get Mrs. BB61 to let me buy it. Thanks for the link. Quick Reply to: Has anyone tried the Franklin Armory Binary Triggers?